This is part 5 of a 9-part series on Stacey Nemours fantastic online flexibility course package for dancers. Recorded one-on-one coaching session via Skype. I like that even though this course is primarily aimed at intermediate/advanced level dancers, I was still able to follow a big portion of the course ‘as is’ – following Stacey/Malenas tempo with Staceys ‘live’ directions. Next to that, thanks to working with the precious courses from this pack in the past few weeks, I was able to adapt the more advanced exercises (ie the ones near the end of the course) to my own flexibility level using props, and/or by substituting them with similar but easier exercises from other courses in the pack. 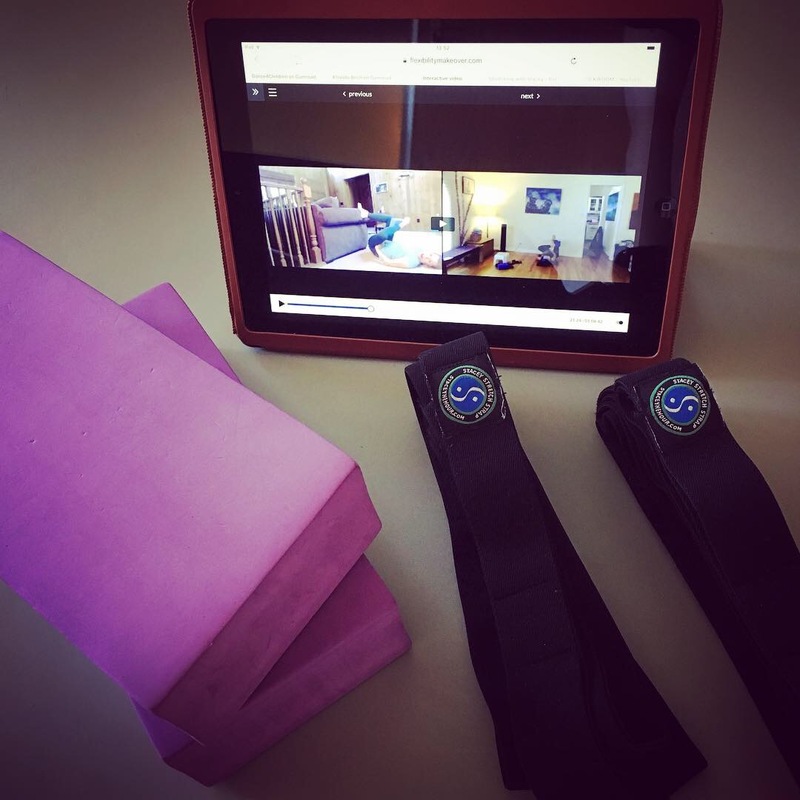 I deeply enjoy the extra focus on releasing and warming up the feet, lower leg muscles, hip flexors, quads, hamstrings, outer hip/lower back thoroughly at the beginning of this course. It makes it a perfect pre-class warmup for ballet/pointe class, even when I only have time to do the first 30-45 minutes. It covers all the areas I need to work on most in ballet. I notice I am able to deepen my pliés, especially in 5th position (something I’ve long struggled with!) whenever I work with this course before taking ballet class. It also feels really nice to work with it the day (or even two days) after pointe class. 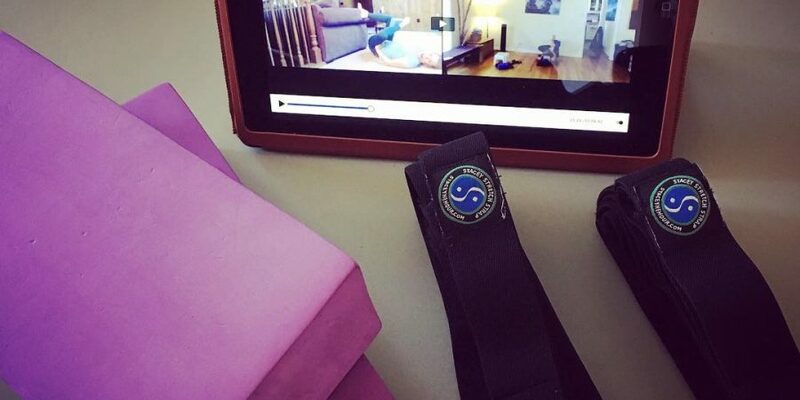 It helps release my lower leg and foot muscles after they’ve been working hard, plus the deep hip openers feel amazing after intense (read: kick-heavy) Taekwondo practise sessions. Last but not least: I noticed an improvement in my front splits alignment after doing this course a few times. My back leg looks more straight, and my hips feel more squared – most probably thanks to the deep hip flexor/outer hip/lower back and quad releases . I love the ‘hip stretch with a block’ variation shown below at about 21 minutes in Module 2, used for deepening the ‘legs-up-the-wall turnout exercise. Stacey takes a bit of extra time for this stretch, which I already knew (and loved!) from the other courses in the pack. A variation of this same exercise includes moving the legs/hips side to side in slow motion to find ‘spots’ that need releasing. So nice. 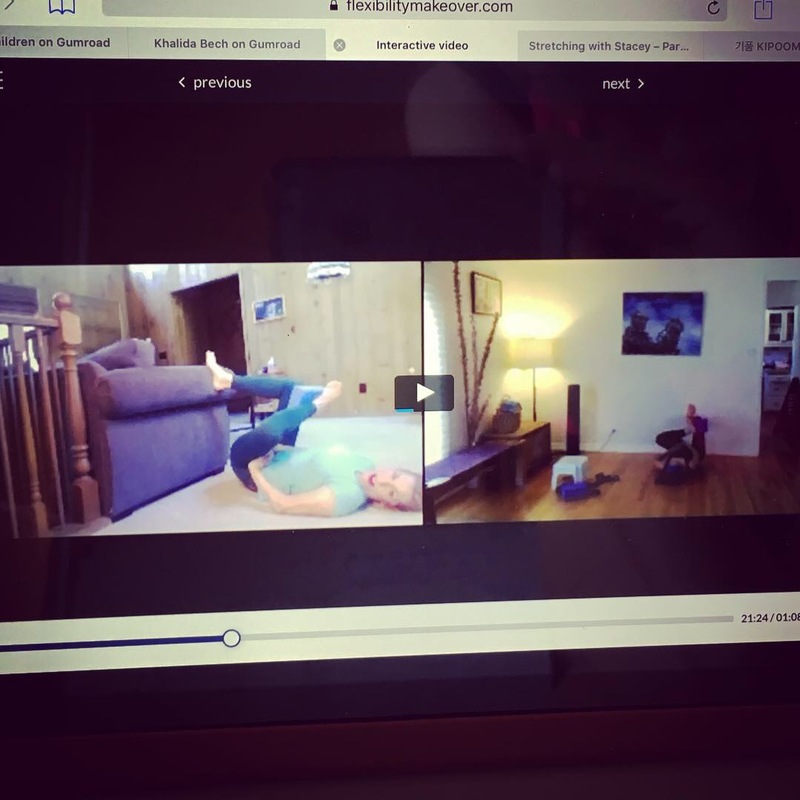 Another favourite is the deep hip flexor release using a step stool (which I do with my front foot propped up on 2 yoga blocks instead of with the stool) – it starts at about 44 minutes in Module 2. If you have any questions about this specific course, or about the Dance! Flexibility Makeover pack in general, feel free to contact me via the comments below. If you have this course, too: Let me know what your favourite exercises are!